I remember our annual Sallah trips to Shagamu from Warri while growing up. For my grand dad, besides the religious significance, the Sallah was also for him, a time when his children and grandchildren would be re-united for 4-5 days every year. I looked forward to meeting my cousins, playing in the red Shagamu soil, eating Ebiripo, Ikokore, coco (sweet cocoyam), Ojojo and seeing Indian, Chinese and Cowboy movies at Rex Cinema. But by far the major highlight of our Shagamu visits were the Ram fights at St. Paul primary school at Ofin, just behind our family compound. For days leading up to the actual Sallah day when the rams would be customarily slaughtered, we would lead my dad’s, gran dad’s, uncles and neigbours rams out to the St Paul school field. These rams would join scores of others from the different surrounding neighborhoods of our Ofin area of Shagamu, in the battle of the head-butts. I still remember the process of selecting fighting partners. My older cousins would carry out the sizing up, baiting and taunting that leads to a challenge and then the rams in question would be lined up with a small section of the crowd watching. Instinctively, the rams would know what to do, take up the challenge and give each other some distance along the same line by moving back without looking, and it’s on! They would use their hind hooves to scratch the earth around them, gather some traction and charge at one another and gbam! 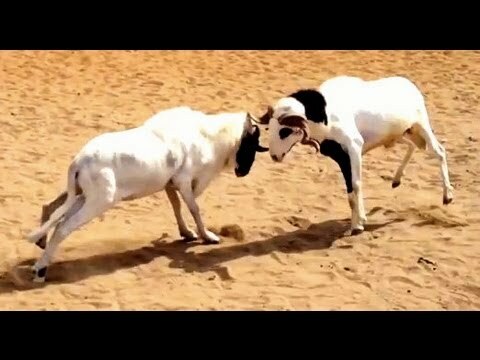 Thud thud thud, this procedure is repeated, without prompting until one gives up either by running away from the aggressor, staying still without charging or the owner throws in the towel by grabbing his ram and pulling away. Your dad had better buy a strong and tough looking ram, because defeat is never good for the ego. I remember this one neighbor who was known for buying very big rams, usually of the stock that had bold white and brownish colour combos. He would forbid his children taking his ram out to fight. So this year, he was away from home long enough for one of his brave sons to lead out this “King of rams” to the field. The whole of St Paul buzzed. Everyone wanted to fight this ram to grant theirs some kind of undisputed title. The owner, brimming with pride, finally agreed to spar with an average sized healthy looking ram. Everywhere became quiet. The big ram charged and won the first series of butts. Our camp was agog with celebratory chants and taunts directed at the other side. The smaller ram was not swayed and kept on coming back for more. On and on they went, thud thud thud. At some stage, we saw the tide turning. Our big ajebutter ram was getting tired and showing reluctance while the other ram was only just starting and getting more determined with different set expressions showing on its face. When the big ram got knocked to the ground and took its time in getting back up, a rapturous noise rent the air from the other side. My big cousin conferred with his friends and advised they throw in the towel. Instead, they decided to go one more try. As they say, pride comes before a fall. 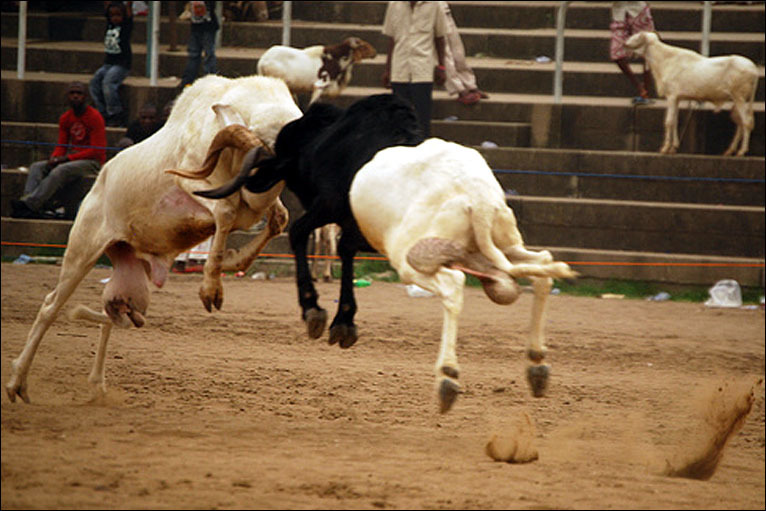 This was to prove a very literal idiom, for in the very next charge ajebutter ram hit the ground and lay sideways with tongue and eyes askew. There was commotion. Even the other side’s ranks were immediately depleted. Yawa race, as my Warri people would say. I have never run so fast to get home and away from any kind of blame. Ileya ram dead? One day to Sallah? Emi ko. Mo yee! The good news is, the egbons in the house went back with the boys and found the ram, up and looking very disoriented. That was the last time I showed any respect to any ram, based on size. I hear they have ram fight clubs that stage all kinds of activities around Sallah in parts of Lagos. I will review the animal cruelty implications (:) ) and, maybe one day, attend one just as a spectator. I wish all my Muslim brothers, sisters, family and friends a happy Eid el Kabir.